Nicholas Herkimer (Herchheimer) (c. 1728–August 16, 1777) was a militia general in the American Revolutionary War, who died of wounds after the Battle of Oriskany. He was the son of immigrants Catherine Petrie and Johann Jost Herchheimer (one of various spellings) from the German Palatinate living in German Flats in the Mohawk Valley in the Colony of New York. He was of slender build, dark complexion, black hair, and not quite 6 feet tall. He could speak both German and Iroquois. In July and August 1775 he headed the Tryon County Committee of Safety, and became Colonel of the district militia. After the split in which loyalist militia members from the area withdrew to Canada, he became a Brigadier General in the Tryon County militia by the Provincial Congress on September 5, 1776. In June 1776, he led 380 men of the Tryon County militia to confront Joseph Brant at Unadilla. Herkimer requested that the Iroquois remain neutral while Brant said the Indians owed their loyalty to the King. When he learned of the siege of Fort Stanwix to the west in late July 1777, he ordered the Tryon County militia to assemble at Fort Dayton. He then marched them out to relieve Fort Stanwix, about 28 miles to the west. 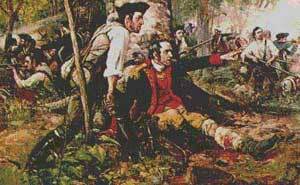 His force marching in column was ambushed on August 6 by a mixed force of British regulars, Tory Militia rangers, and Mohawk Indians in the Battle of Oriskany. Herkimer's horse was shot, and he was seriously wounded. In spite of his injuries, he sat propped against a tree and lit his pipe. He rallied his men to avoid two panicked retreats, and when they withdrew they carried him home. His home, in what is now Danube, New York, is preserved as the Herkimer Home State Historic Site. Herkimer County, New York was named in his honor. His nephew, John Herkimer, later became a U.S. Congressman.